If you’re looking for the best interest rates in the industry, Wells Fargo likely won’t be the bank for you. The bank does offer some high rates, but those are mostly reserved for a few CD accounts. Even the standard long-term CDs from Wells Fargo have pretty low rates. A number of accounts do offer the opportunity to boost your returns with Bonus Rates by linking a specialty checking account. Higher account balances can also snag some higher interest rates, depending on the account. Wells Fargo can offer a ton of convenience and ease in your banking experience, however. You can access your accounts online, on mobile, at a branch or ATM and over the phone. There are a number of features that help you manage your money and keep it secure. Known for its identifiable red and gold stagecoach, Wells Fargo began operating its own stagecoach system six years after its inception in 1852. This was to upgrade its banking and express business to be faster and more convenient for its customers. Although unnecessary in today’s technology era, Wells Fargo continues to use the stagecoach as its icon and at events like parades. The bank has also adapted with the times, with robust mobile and online offerings. Not only can you open a simple savings or checking account, but you can find wealth management services, mortgages, auto loans and more. It is important to note that in 2017, it was discovered that the bank’s employees had opened over 3 million fake accounts and enrolled thousands of accounts in online bill pay without customer consent. This was allegedly to meet unrealistic sales goals. Since the discovery, the company has pledged to pay millions of dollars to refund its wronged customers. When you bank with Wells Fargo, you’ll have access to a ton of features that make banking more convenient. For starters, you’ll be able to bank in person at about 13,000 Wells Fargo ATMs and more than 6,000 branches. When you’re unable to bank in person, you can use both Wells Fargo Mobile® and Wells Fargo Online® to bank from your home and while on the go. Whether online or in person, you’ll be able to send and receive money, pay bills, set up account alerts and more. You can also take advantage of Wells Fargo’s predictive banking feature beginning in February 2018. This tool analyzes your transactions, payments and other account data to generate financial guidance. For example, if you make a monthly recurring payment, but one month you don’t have enough funds to make the payment, predictive banking will take notice and send you an alert. The bank can then provide an option like transferring funds into the account to cover the payment. Having a Way2Save® savings account makes saving an easier and more automatic part of your financial habits. You have to link the account to a Wells Fargo checking account to take advantage of two automatic savings options. Your first option is to use the Save As You Go® transfer program. This allows the bank to automatically transfer $1 from your checking account every time you make a debit card purchase, pay bills online with Online® Bill Pay or make automatic payments from your checking account. Your other option is to set up monthly or daily automatic transfers in amounts of your choice. If you’re saving monthly, the deposit has to be at least $25, with the daily minimum set at $1. Linking together a Wells Fargo checking account with your Way2Save® account also allows you to use your savings account for overdraft protection. This savings account also includes an ATM card for easy access. If you already have a debit or ATM card, though, you can easily link that card to the savings account instead. A Platinum Savings account offers the same ease and convenience as the bank’s basic savings account. This includes optional overdraft protection, an ATM card and automatic transfers. You’ll also have access to My Savings Plan® which can help you set savings goals and track your progress toward those goals. This account also includes check-writing abilities. However, the Platinum Savings account offers the opportunity to earn at higher rates. For starters, there is a Special Interest Rate that lasts for three months. It requires at least $25,000 in new funds to be deposited into the account. If you can't meet that high amount, you still have the chance to earn at bonus interest rates. You can do this by linking a Portfolio by Wells Fargo® checking account to your Platinum Savings account. Having a high account balance can also boost your interest rate. Fees None, although you may face a penalty for early withdrawal. Wells Fargo offers a few fixed rate certificate of deposit options. For starters, you can choose between four Special CDs, from nine-month, 19-month, 39-month and 58-month terms. A Special CD earns at higher rates than a Standard CD. It’s important to note that a Special CD will automatically renew at maturity for a different term length. The nine-month term renews to six months; 19-month to 12 months; 39-month to 36 months and 58-month to 48 months. Once the CD renews, it will earn at a standard interest rate and not the special rate. The bank’s Standard CDs earn at some of the lowest rates in the industry, especially for CDs. CDs typically have higher rates than a basic savings account. You’ll benefit best from opening a Special CD to start. Both account types do offer the opportunity to earn bonus rates. You can do this by opening and linking a Portfolio by Wells Fargo® checking account. Instead of earning at a set interest rate for the entirety of the CDs term, a Step Rate CD bumps up the interest rate at certain intervals. The Step Rate CD increases the interest rate every six months. With this system the APY represents the total interest that will be paid from all step rates during the term of the CD. This is assuming you don’t make any early withdrawals, which will also trigger penalty fees and lessen your return. At maturity (after 24 months), the Step Rate CD will automatically renew as a standard 24-month Fixed Rate CD. You will have to visit a bank branch in person to open a Step Rate CD. This simple checking account is made for everyday use. It has the lowest monthly fee, which you can easily waive by meeting an account requirement. For example, if you use your debit card for at least 10 purchases or payments a month, which is easy with a primary checking account, you can avoid the fee. You can also take $5 off the fee when the primary account owner is 17 to 24 years old. The Everyday Checking account includes standard features like mobile deposits, online bill pay and transfers and text banking. 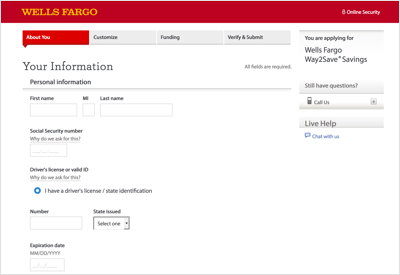 You’ll also have access to Wells Fargo tools for budgeting, cash flow management and spending. The bank provides solid security measures, too. This includes 24/7 fraud monitoring, zero liability protection, account alerts and debit card chip technology. These features help protect you and your money. This is the bank’s more advanced checking account. It comes with all the same features as an Everyday Checking account, like online bill pay, online transfers, mobile deposit and money management tools. However, this account also provides owners with a Platinum Debit Card with chip technology, Instant Access Debit Card, free cashier’s checks and a $10 discount on personal style checks. The Preferred Checking account also earns a little bit of interest on account balances of at least $500. At the lowest rate, you shouldn’t expect your checking balance to grow substantially. This checking account is for customers with substantially higher account balances. While a high balance isn’t required to keep your account, it allows you to earn at a higher interest rate and have the account’s high monthly fee waived. Account balances of $250,000 or more also waive fees for incoming wires, stop payments and ExpressSend remittance services, and receive unlimited reimbursement for non-Wells Fargo U.S. ATMs (five reimbursements for international ATMs). The Portfolio by Wells Fargo® Checking Account includes a number of built-in perks. This includes free Personal Wallet checks, cashier’s checks, personal money orders, overdraft protection and cash withdrawals from non-Wells Fargo ATMs. You’ll also receive a Platinum Debit Card and have 24/7 access to the Wells Fargo Premier Banking Team. The account’s perks extend beyond the account itself, too. Simply having this checking account can waive the monthly service fee on additional checking and savings accounts, waive the fee on one eligible HELOC, discount interest rates on select new loans and provide special credit card benefits for your Wells Fargo Visa® credit card. If you’re unable to open a standard account due to bad banking history or low funds, the Opportunity Checking® account could be a good place to start. There is a monthly fee, although it’s the lowest the bank offers. You can also waive the fee in a few different ways. With this account, you’ll have access to checks, a Platinum debit card and Online Bill Pay. You’ll also be able to use My Spending Report with Budget Watch which helps you track and monitor your spending. You will have to visit a branch in person to open this account. This Teen Checking account is available to teens from 13 to 17 years old. The account will need to have an adult co-owner, although both parties will have equal access to the account. Plus, monitoring the account is made easy for both parents and teens with account alerts, online access and mobile banking. Parents can set limits on purchases and withdrawals to help their children learn about responsible spending. Account holders will also have access to My Spending Report with Budget Watch which works to help customers develop budgeting skills with free money management tools. Access to Your Account Online, mobile, over the phone and at physical branches. Fees None, although you may face a penalty fee for early withdrawal. When it comes to retirement accounts, the bank offers its Destination® IRAs. There are a number of Destination® IRA CD options to choose from. You can choose from four Special CD term lengths, either nine-month, 19-month, 29- month or 39-month terms. These Special CD accounts earn at higher interest rates. You can also open a standard CD anywhere from three to 144 months long. Again, to earn at Bonus Rates, you’ll need to also maintain a Wells Fargo Portfolio Checking account. You can open any of these IRA CDs as a traditional or Roth IRA. You have two options when opening a Destination® IRA Savings Account: a Way2Save Retirement Account and a Retirement High Yield Savings Account. Both accounts offer pretty low interest rates, although a higher Retirement High Yield Savings Account balance can get you the highest rate of these options. These retirement savings accounts allow you to make automatic transfers from a Wells Fargo checking or savings account. You can schedule these transfers to occur weekly, biweekly, bimonthly, monthly or on the last Friday of each month. Plus, as you experience life changes and adjust your goals, you can easily adjust those settings to better reflect your savings plan. Where Can I Find Wells Fargo? You can do virtually anything you need online. You can apply for most of its bank accounts online, find your nearest location, make an appointment at a location and much more. When browsing the bank’s account offerings, it’s easy to find the necessary information like interest rates and minimum deposit requirements. Once you’re a customer, you can easily log into your account(s) online using your username and password. You can also log into your account(s) on mobile. When you use your mobile app, you can deposit checks and even request an ATM code to use at a Wells Fargo ATM in lieu of your debit card. That feature is shown in the accompanying image. You can access your money wherever you can find the bank. This means online, on mobile, over the phone, at an ATM or at a physical branch. Of course to access your accounts, you’ll need your username and password online and on mobile, your mobile wallet or ATM card or your account information at a branch and over the phone. No matter how you access your accounts, you’ll be able to transfer money, pay bills, set account alerts, deposit checks on mobile and more. How Can I Save More Money With a Wells Fargo Account? To earn at the highest interest rates the bank can offer, you’ll want to open a Special CD. The rates are even better when you link a Portfolio by Wells Fargo® checking account. If you don’t want to open a CD, you can still save more by linking a Portfolio checking account. You can also typically earn more with higher account balances. What’s the Process for Opening an Account With Wells Fargo? You can open most accounts online, by clicking the “Open Now” button for the account you’d like to open. You’ll then be taken to the page shown here where you'll provide information like your Social Security number, government-issued ID and employment information. You’ll also have to make your initial deposit at this time. If you have any questions during the online application process, there is a Live Help Chat option on the right side of the application page. You also have the option of making an appointment with a banker, visiting a local branch or calling the bank at 1-800-869-3557. You will have to open a Step Rate CD or Opportunity Checking® Account at a branch. The main catch to banking with Wells Fargo is that its interest rates aren’t that high. This is to be expected from a big bank that also offers mortgages, small business loans and more. Plus, the company has to maintain over 6,000 physical branches. If you’re looking for the highest rates in the industry, especially for CDs, you’ll want to look elsewhere. Wells Fargo provides a pretty well-rounded banking experience for its customers. You have a wide variety of bank accounts to choose from, alongside credit cards, auto loans and more. So whether you want a simple savings account, a Special CD or a checking account for your teenage daughter, you can find that here. A downside to banking with Wells Fargo is that it doesn’t offer the most favorable interest rates. Banking may be convenient, but if you’re really looking to grow your money with high rates of return, you’ll want to look elsewhere.